Alexander Jamieson (1873-1937) - painter of landscapes, chiefly views of French towns and gardens, and occasional portraits and genre. Born 23 September 1873 in Glasgow. Studied at the Haldane Academy, Glasgow, and won a Scholarship to Paris in 1898. Influenced by Manet and the plein-air painters as well as Constable. Member of the International Society 1904. On the Managing Committee of the A.A.A. 1908. Executed wall decorations at Bridgewater House 1910. Visited Spain 1911. First one-man exhibition at the Carfax Gallery 1912. Served in France 1914–19. 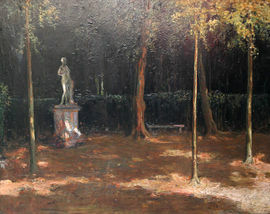 Exhibited at Glasgow, the Goupil Gallery and from 1928 at the R.A. Lived at Weston Turville, Buckinghamshire. Died in London 2 May 1937.